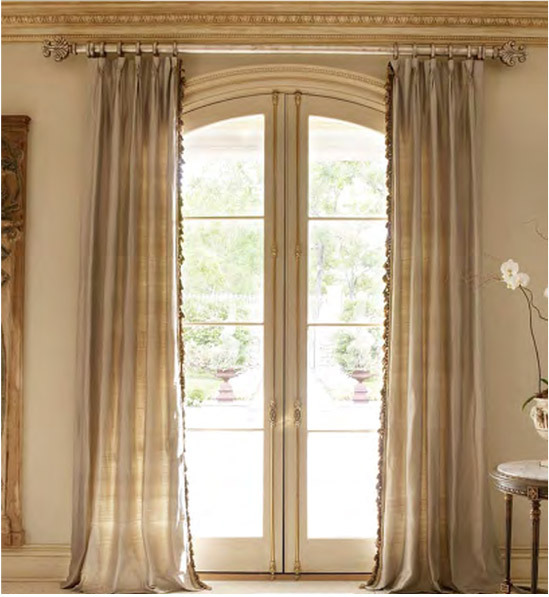 The positioning of the curtain rod will depend entirely on individual preference and the length of your curtains. There is no industry standard or rule of thumb. However, the positioning of the curtain rods can change the appearance of the window and sometimes the entire room. For example, if you would like your window to appear wider, you should use a curtain rod that is longer than your window. Ff you would like to make your window appear taller you should place your curtain rods as close to the ceiling as possible. This will not only make the window appear higher, but will also make the room feel taller. We will now examine several pictures and evaluate their curtain rod positioning. In this photo we can see that the curtain rod was placed roughly 10 inches above the door frame and is as close to the ceiling as possible. This gives the illusion that the door and the ceiling are taller than they are in reality, especially when the curtains are closed. The curtains are not very wide and are just about 4 inches away from the door frame which gives them a slim, elegant look and feel. In this photo we can see that the curtain rod was placed just about 1 inch above the top window frame. In this case this exact rod positioning works well because the rod is placed parallel with the beginning of the cornice which is very beautiful. However, the width of the curtain rod does not work very well in this situation because the window frame is visible, and should be covered by the curtains entirely. Therefore, you should always aim to cover the entire window frame. In this application the curtain rod should have been at least 4 inches wider on each side so that it is aligned with the widest part of the cornice. This photo perfectly illustrates how to position a curtain rod on an arched window. It is important to point out that when closed, these curtains completely cover the arch window. 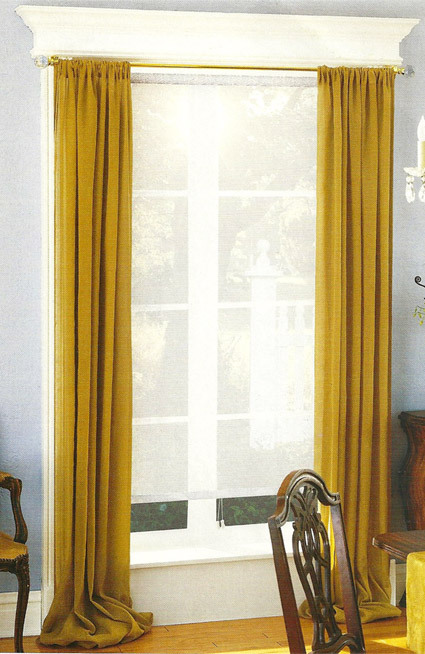 Therefore you should always make sure that the fabric covers the window entirely when curtains are closed. This is another great example of a beautiful arched window curtain rod positioning. We can see that this rod was placed about 2 inches above the arched window,. 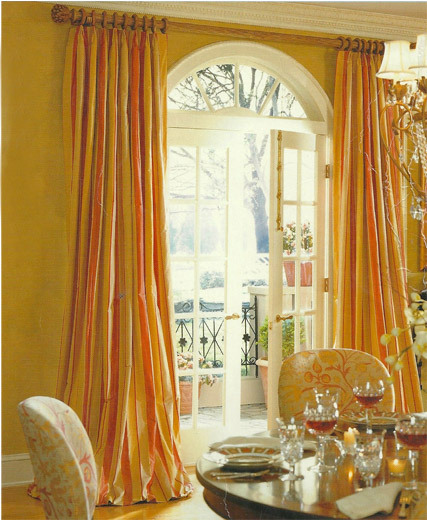 This is an ideal height because when you close the drapes, the arched window is completely covered. Additionally the curtain rod is of ideal width since it covers the entire door frame. 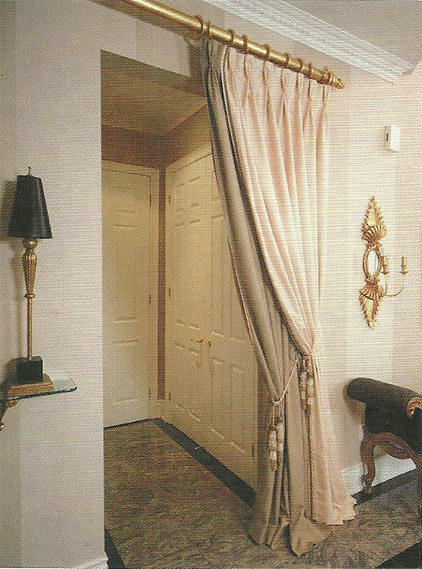 This photo shows a nice example of a door curtain application. As you can see the curtain and rod add a very nice look to the room. 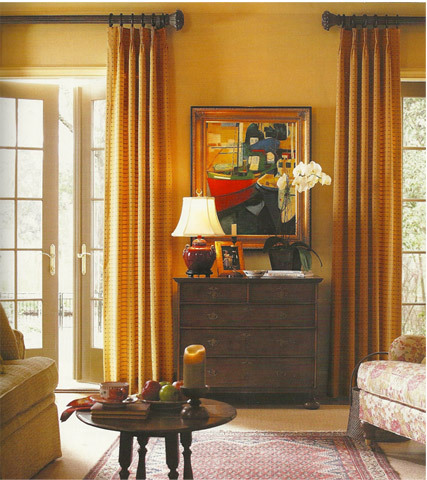 The poisoning of the curtain rod is roughly in the middle of the ceiling and door opening, which creates a balanced look and feel. The rod could have been placed a few inches higher or lower and would still look great, but placing it in the middle adds proportion which is aesthetically pleasing.